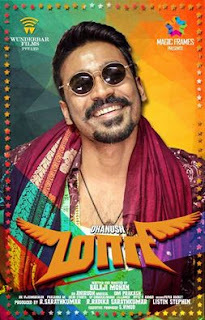 Maari is the upcoming tamil movie directed by Balaji Mohan, having Dhanush and Kajol Aggarwal in the lead. The movie is produced under the banner of Wunderbar films and Magic frames. The music composition is by Anirudh. The film is expected to be released by mid of 2015. The first movie by Balaji Mohan was 'Kadhalil Sodappuvadhu Yeppadi' starring Siddharth and Amala Paul, which was hit, while his second movie 'Vaayai moodi pesavum' just did a good run . Now when the director is joining with Dhanush, there is huge expectations for movie lovers.